Are cars going to be banned from one side of College Green? WILL CARS BE banned from one side of Dublin’s busy College Green area? That’s what the council is mulling over, but there aren’t concrete plans in place yet. 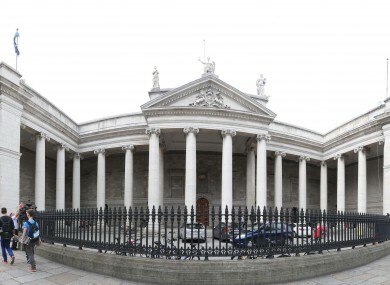 A report in today’s Irish Times on Dublin City Council’s Hidden Rooms event said that it is proposed that cars be banned from one side of College Green in a trial. It reported that the proposal includes temporarily closing down traffic lanes to test if an enlarged pedestrian plaza in front of the Bank of Ireland would be viable. At the event, Dublin City Council presented some of the concepts it has been developing for improving the public realm in College Green. The proposals are inspired by the building of the Luas Cross City, which will be completed in 2017. Because the Luas Cross City will go through College Green, this will require new traffic arrangements during construction and afterwards, and the council sees the Luas works as “an opportunity to rebalance College Green to serve the needs of all users”. Dublin City Council sees the College Green area as one of the city’s “preeminent civic spaces”. Consensus for any proposals would have to be built with the National Transport Authority, transport providers, businesses and the public. Email “Are cars going to be banned from one side of College Green?”. Feedback on “Are cars going to be banned from one side of College Green?”.